Raised in Huddersfield, she’s also a fierce Yorkshire gal like myself. I’m sure she wouldn't appreciate me sharing her date of birth so we will skip that bit. She’s always been incredibly smart being a straight A student, and although she didn't manage to play cricket for England’s men's team as her father had hoped she certainly has achieved some pretty impressive things in her time. 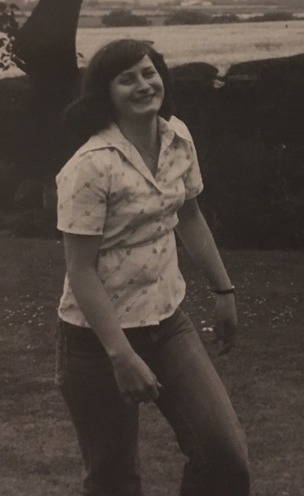 Age eighteen she packed up her flared jeans and Jonie Mitchell LPs and headed off to The University of Bradford to study Optometry. It was during this time that she met fellow flare wearing, hippy Justin Terry aka my Dad, who was studying Textile Design. 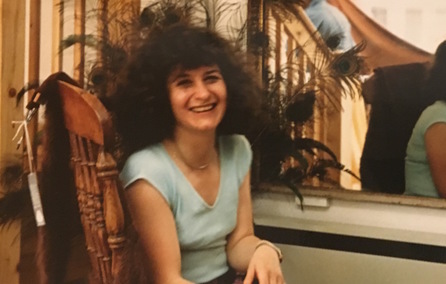 After graduating with a 2:1 degree in Optometry, my parents left Bradford and moved to my Gran’s farm, and Dad’s childhood home, in Scarborough, where mum soon found herself lambing sheep, feeding chickens and podding peas. But they weren’t there long, as Justin was offered a textiles job in… Columbia! 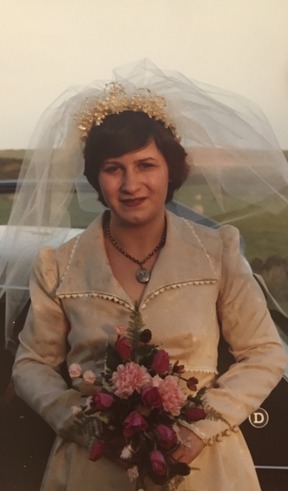 In order to be able to live together they would have to marry, so on a cold and muddy December day, a wedding was held and Judith Ann Corns became Judith Ann Terry. This would be a very good moment to mention one of Jude’s other incredible talents. Sewing. Anyone who knows Jude will tell you what an incredible seamstress she is, making everything from curtains, ballet costumes, delicate cloth dolls and even my prom and her wedding dress! Turns out Columbia wasn’t on the cards after all and the job offer fell through, but rather than settling into a regular life in Scarborough, they jumped on a plane and moved to South Africa! Although fully trained as an Optician she found her first job working in the soup department at the Nestle factory, but it wasn’t long before she had a Retinoscope back in her hand and she was opening her very own Optician's Practice in Standerton. After five happy years of the sunshine it was time to return to England and settle into family life. That’s right! Enter Lauren! Well no, not quite. Enter older brother and Golden Boy Tristan first. The beautiful bouncing baby boy, always happy and quiet as a mouse. Eighteen months later enter Lauren. With big blue eyes, a wonderfully 80’s perm, and the cry of a banshee! It was clear to The Terry Family that the quiet days were officially over. But enough about us- back to Mum. Still working as an Optician Jude also played an active roll in husband Justin’s tailoring business Ankaret Cresswell. She helped with some of the more fiddly sewing bits such as button holes and invisible zips as well as joining him on the show scene. The same show scene that she exhibits at today with a completely different business! Full of energy and laughter she has always had a great repertoire with people which makes her such a natural working with people. Jude continued to work as Optician for thirty years until finally retiring in 2013. 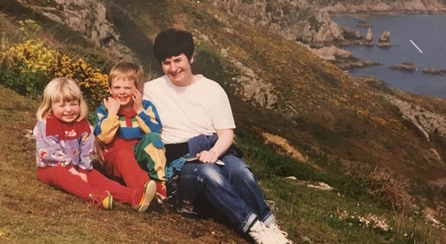 After three decades working and raising children she now had time to travel, read, sew and socialise and do all the wonderful things retirement brings. Well for a month at least. When one day her daughter Lauren was asked to paint twenty cows so a local gallery could host an exhibition! Rather than just congratulate her daughter, attend the exhibition, and support her from the sidelines, Jude decided to throw herself into action, sending out invites, organising refreshments and taking care of sales. From that day forward Jude knew that she wanted to be a part of this journey and pair up with her daughter building an exciting new brand from nothing. Using skills she gained in all aspects of her life to build an art business to be proud of. Five years later Jude is living in the beautiful Cumbria Countryside with Justin and Labrador Jackson. Lauren’s Cows has grown immensely and is now a full time job for the both of us and we love what we do. Of course we have our moments, when we panic, and squabble, but we have many more when we laugh! 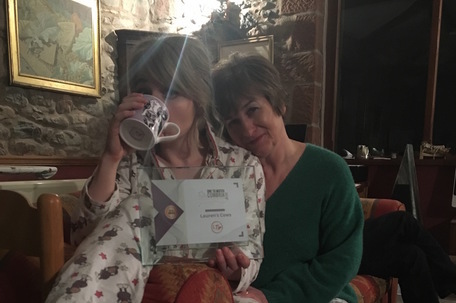 And just the other night my dear Mum and I won an award for our home grown business at The Cumbrian Family Business Awards. What better way to celebrate mother’s day? So here’s to the glue who holds our business together, To my Mum, to Jude! p.s. DO NOT take her on in a trivial pursuit game whatever you do! You WILL lose! Strange story; I was stationed in North Yorkshire in the late 1980's and came across your father's fabric at one of the Ag Shows and fell instantly in lust (with the fabric though I am certain your dad is a lovely person). I ended up visiting a cottage with a loom somewhere and have never been able to find his fabric again. I now live on a farm in the middle of nowhere in Missouri and find you painting amazing cows!